High blood pressure or hypertension is excessive pressure exerted against the artery walls as the heart pumps away the blood. Hypertension is becoming prevalent amongst the urban Indian population due to unhealthy lifestyle and bad eating habits. Studies suggest a strong lifestyle correlation to this disease. 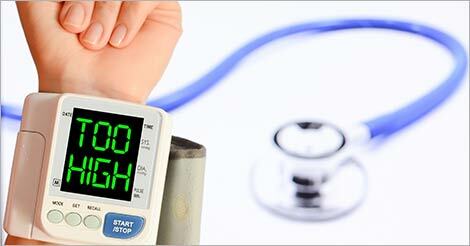 Blood pressure reading is measured in two numbers - 120/80. The above number is the systolic pressure, which is the pressure as the heart contracts and pumps blood into in the arteries. The below number is diastolic pressure, which is the pressure in the arteries when the heart relaxes after contraction. This is more commonly seen among people but its actual reason is yet unknown. However, genetics and unhealthy lifestyle plays a vital role in developing this condition. Maintaining blood pressure as per the prescribed range is essential to stay away from life-threatening diseases such as heart fail or heart attack or stroke. Precautionary measures are necessary to keep the blood pressure level under control. Along with adopting healthy habits, a complete health checkup would also prove useful to get to know about your current health condition. Fill up the query form to opt for this health checkup.